Toys 'R' Us has filed for bankruptcy protection in the US and Canada as it attempts to restructure its debts. The firm was once a dominant player in the US toy market, but has struggled against larger rivals such as Amazon. The move casts a shadow over the future of the company's nearly 1,600 stores and 64,000 employees. 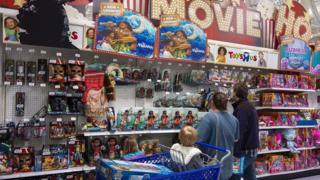 However, a US bankruptcy judge approved a loan of more than $2bn to help stabilise the toy chain. The aim is to give Toys 'R' Us money and time to prepare for the upcoming Christmas shopping season. The firm's European operations are not part of the bankruptcy proceedings and Toys R Us says it does not expect any immediate impact on its UK stores. Toys 'R' Us's operations in Australia, about 255 licensed stores and a joint venture partnership in Asia are also not included in the bankruptcy move. The bankruptcy filing is more evidence that traditional retailers are struggling in the US, as online retailers continue to capture market share. Toys 'R' Us said the majority of its stores around the world remained profitable, and would continue to operate as normal through the holiday period, which is when they do most of their business. But the company is also looking to online sales to secure its future, with recently launched web stores for its products. GlobalData Retail estimates that in 2016 about 13.7% of all toy sales were made online, up from 6.5% five years ago. "The past decade has seen a dramatic change in the domestic toy market with new channels, increased competition, and new technology all having a deleterious impact on the sector and traditional toy stores. Unfortunately, Toys 'R' Us has not responded effectively to these challenges," said Neil Saunders, managing director of GlobalData Retail. Gary Grant, founder of UK toy shop chain The Entertainer, said people's buying habits were changing. "We're seeing it even in the supermarkets, where the big sheds aren't being visited as frequently as more convenient in-town locations," he told the BBC. "So we're seeing in grocery the convenience stores are much more successful now than some of the over-spaced units that the grocers have." Toys 'R' Us wants to use the bankruptcy process to restructure and make the company viable over the long term. Enormous debt levels are its most immediate problem. Various lenders, including a JPMorgan-led bank syndicate and some of the company's existing lenders, have committed more than $3bn in new financing to turn the company around. "A combination of high debt and severe structural changes in the industry created a toxic mix against which Toys 'R' Us had little choice but to restructure and try to put itself on a firmer footing," said Mr Saunders. However, the company says the new financing will improve the company's financial health and support its operations during the court-supervised bankruptcy process. "Our objective is to work with our debt holders and other creditors to restructure the $5bn of long-term debt on our balance sheet, which will provide us with greater financial flexibility to invest in our business," said chief executive Dave Brandon. Toys 'R' Us is one of a number of traditional US retailers to have run into trouble recently. Department store chain Sears has been struggling with falling sales and heavy losses. In January, it announced the closure of more than 100 stores. Other department stores - including Macy's, which also owns Bloomingdales - have also seen sales slide. US clothing chains The Limited and Wet Seal filed for bankruptcy protection earlier this year, as did discount shoe retailer Payless. Video Can US retailers keep their doors open?